Thor #8 finally returns to the War of the Realms after taking a little time off to give the readers some instant-classic tales of Thor’s past and future. Written by Jason Aaron, with art by Mike Del Mundo, this nonlinear tale continues with the theme of “worthiness”, and uncovers Thor’s neverending mourning of Mjolnir. Previously, Malekith started making big moves to take over all ten realms, including Midgard, but Thor returned as the God of Thunder, intent on stopping him, by any means possible. Unfortunately, that’s proven a very difficult task, because the rainbow bridge (the main way to transport between realms) has been destroyed, and Thor is relying on an arsenal of substitute hammers ever since Mjolnir was sacrifice to save countless lives. Now, Odinson and Valkyrie have traveled to Heven to rescue his sister Angela from her own people, Angels who have sided with Malekith in the war. 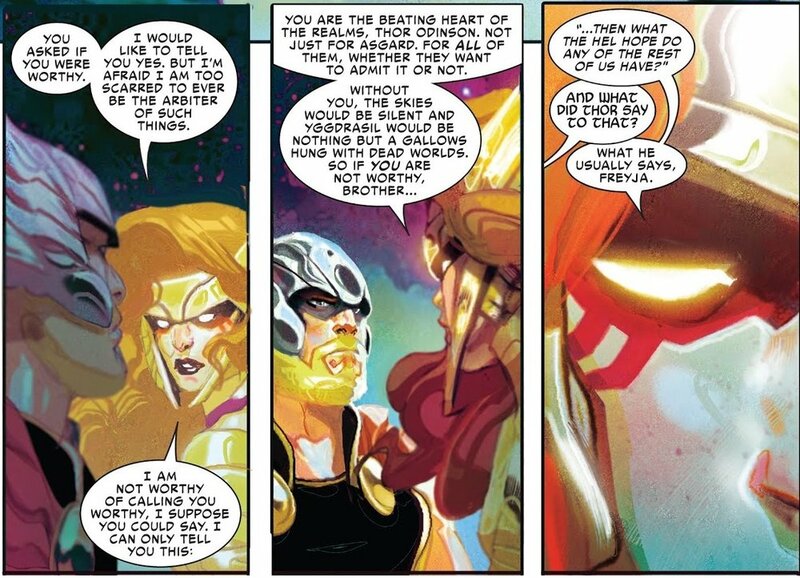 As always, Aaron does an amazing job showing the complexities of Thor’s character. He’s a hero through-and-through, yet he is somehow still eluding “worthiness”. This issue reveals that Odinson has been carrying around the last remaining bit of Mjolnir on a chain as a constant reminder of his being unworthy. Every day this god tortures himself, missing his hammer, barely able to lift even the smallest sliver of its remains. He even asks Angela if she considers him worthy when they’re imprisoned together. As Aaron showed in the previous chapter, Thor gaining his worthiness was pretty much the origin of Odinson as we know him, setting him on the path of being one of the Marvel universe’s greatest heroes. Now that he’s lost that worthiness, and subsequently Mjolnir, he is feeling like he’s missing the most important piece of himself, no matter how much good he does across the ten realms. This is a simple issue, much like the previous few, that tells a one-and-done type of story, despite being connected to the overall War of the Realms arc. Little is gained, and the story moves forward in the smallest of ways, but the readers are given great insight into Thor’s character, and his suffering, by Aaron. One could argue that Aaron is trying to buy time, because the War of the Realms story only officially kicks off in four months, but it would be impossible to debate the value of these one-off chapters, because they are so chock-full of important character moments for Thor. Del Mundo, possibly one of the best Thor artists of all time, always delivers the goods. This issue is no exception. Perhaps it is because he is handling his own inks and colors, or because he is just born to draw the fantasy genre, but Marvel would do well to hang onto him as long as they can keep him on this title. Again, Jason Aaron can do no wrong on this book. Even when Odinson wasn’t the main character, he delivered some of the best Thor stories in years. Now that Odinson has returned, even though he’s missing Mjolnir, the readers are still being treated to excellent storytelling and character development in every issue. This chapter, a simple story of Thor and Valkyrie attempting to break Angela out of an Angel prison, was deeply moving, and leaves you worried for Thor in a major way. This is, without a doubt, one of Marvel’s best books running, and if you’re not picking it up, you’re missing out in a major way.